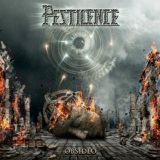 The return of Pestilence in their modern, groovier form has gone from curiosity to disappointment and relief in 2011 when Doctrine turned out to be rather good (if slightly overscored in retrospect...!). Following on, it's easy to have good-to-high expectations for Obsideo, and it gives me a warm, fuzzy feeling to be able to say that yes, it kicks copious arse. The line-up changes – bassist Jeroen Thessling (Obscura, Mayan) and drummer Yuma van Eekelen (Exivious) are out and drummer Dave Haley (Psycroptic, Ruins, The Amenta, etc) and bassist Georg Maier (this is his first band, as far as my research revealed) is in – are interesting and work well, especially Haley, who is a favourite of mine and who performs brilliantly here. Obsideo follows on from Doctrine but also moves onwards; it seems at once more vicious and more technical, more confidence in riffs and complexity, and less tied-up in concept album features such as the interludes. Apart from the sound of someone's last gasping breaths that opens the album and the odd synth line, Patrick Mameli wisely lets the music do the storytelling here with a more loose theme of the journey of the human soul. In the here and now, there's little doubting the death metal rush of the opening title track, Mameli's yowl slightly lower than on the last albums and more in fitting with the music. You can tell a guitarist is in charge from the solos that lovingly take their time, and although at just over four minutes it's the longest song on the album, that's not a bad thing – Obsideo is full of these short yet sharp pieces, woven together skilfully and making enough impact to leave you wanting more. One major minus point – the production and eight-string guitars make it harder to hear the bass, which is a big disappointment to me, as Pestilence have always been excellent at incorporating bass into their music. It's still audible, thankfully, but makes far less of an impact, leaving the guitars to take the weight. Thankfully, that's not a bad thing; say what you like about Mameli and the various stupid things he's said in the past, but the man is a damn good guitarist, and together with Patrick Uterwijk makes Obsideo a technical delight. Sure, some songs rely more on groove than others, but they do it well, the snaky opening of Aura Negative leading to a nicely speedy section, for example, before indulging in some Meshuggah-esque crunching. The following NecroMorph has a very modern chug at first but soon opens up into a Pestilence-ial torrent of sound, ending on a lovely melodic flourish. It is easy to focus on the chugs and miss the rest, but it would be a mistake; even a Pestilence not at their best are better than many others, and there are more than enough kick-arse riffs like that opening Distress to keep old-school fans nodding along. Ultimately, Obsideo has smoothly combined both sides of the Pestilence sound, old and new, and the resulting merger sounds pretty damn good.